The cool thing about Disneyland (or any of the Disney parks really) is that you can go over and over again and still find new things to explore, even for seasoned Disney veterans. If you go rarely, you’ll often make plans to hit the “big” places, but then you might miss some of these hidden treasures. When you’re making plans, these might be a couple of places to keep in mind! This little gem is situated at the far end of Main Street as you walk in on the right hand side by the Kodak camera shop. It’s unobtrusive and looks like part of the decor except at times you’ll see a line of people just waiting to get their corn dogs. At one time, these dogs were HUGE, but they’ve scaled back the size to where they are about normal (although still pretty big). The cornmeal batter crust around the dog is excellent and it’ll make you wish there were more. They pretty much sell just the one thing (corn dog and chips combo) so if you want a burger or something else this is not the place to go. But if you’re hankering for a good ol’ fashioned corn dog – this is the place to be. Another great place that’s pretty unobtrusive and again, if you want a large variety to choose from this isn’t the place to go. But if you like a nice, warm, portable meal you can’t go wrong here. The clam chowder is great and the bread bowl is good too – a nice sourdough loaf hollowed out for your eating pleasure. They also have a vegetarian and steak gumbo for those who want something other than the creamy goodness of the clam chowder. And they serve fritters which if memory serves me well are pretty good. It’s also a nice little corner to relax in if you want to sit and rest your feet for a bit. If you want a full meal (not that the bowl of soup won’t fill you up because it pretty much can), there are three great restaurants nearby (four if you count Club 33). 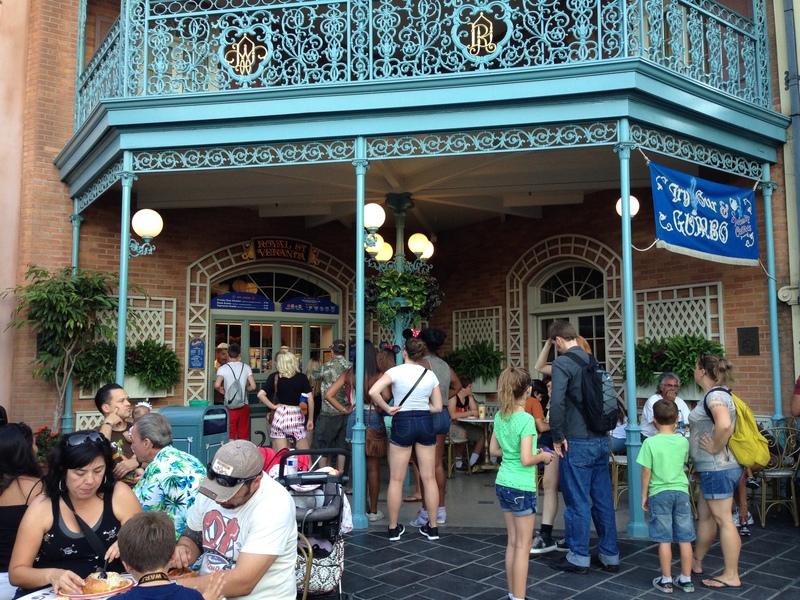 You’ve got Blue Bayou, French Market, and Cafe Orleans – all of which serve great food at varying prices. But for a nice tidy meal, it’s hard to beat this place. For something different, come to Maurice’s Treats located at the new Fantasy Faire to the left of the castle (as you face it). Maurice’s Treats is served from a stand-alone cart and again offers limited fare, but if you’re looking for something new and different, this is a good place to try. No hearty meal food here, just bread and the Boysen Apple Freeze (and water). They have three twists – chocolate, strawberry, and the Cheddar Garlic Bagel Twist. 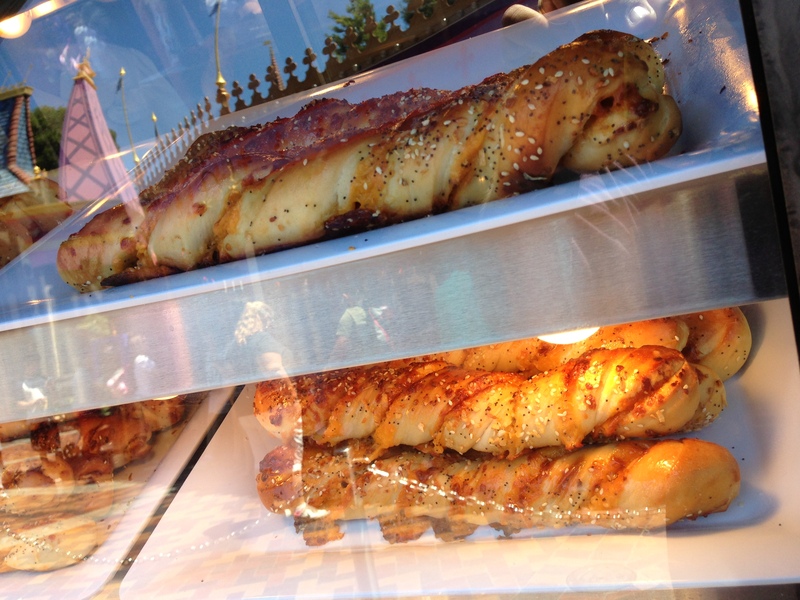 Of these, I would recommend the Cheddar Garlic Bagel Twist. It was filling and tasty and just as the name implies. The chocolate and strawberry twists are more like French pastries so it isn’t like a churro but more like a croissant. Each are dusted with powdered sugar, but not so much as to make it noticeable. The chocolate one is more of a bitter or dark chocolate so if that’s not a flavor in your taste palette, then this is something to avoid. It is light and flaky like you would expect a croissant to be and a little messy if you’re trying to pull it apart. The Boysen Apple Freeze is good, but the foam is disconcerting. The texture was a weird mix with the freeze and didn’t add to the flavor. You could get hints of the boysenberry, but pretty much this is a sophisticated apple juice freeze. If you love apple juice or your kids do, this is a fun way to drink it. Sometimes, the fun in eating at the park is trying different things. Each of these places might or might not appeal to you, but it’s one of the things I appreciate about Disney – the variety and diversity they appeal to! Bon appetit! 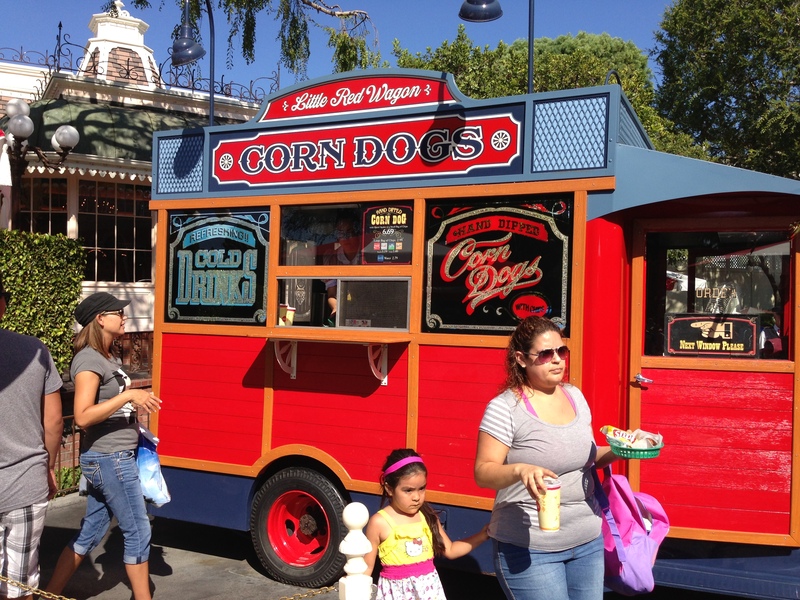 Pingback: Disney Foodie Spotlight: Corn Dog Castle in Disney California Adventure | Disney Nerd!